3 Bedroom villa with private pool, Amazing views. Casa Monte Clara is located in the hills of Andalucia within a 10 minutes drive of Lake Vinuela and 5 minutes to the white washed traditional village of Riogordo with its bars and shops. 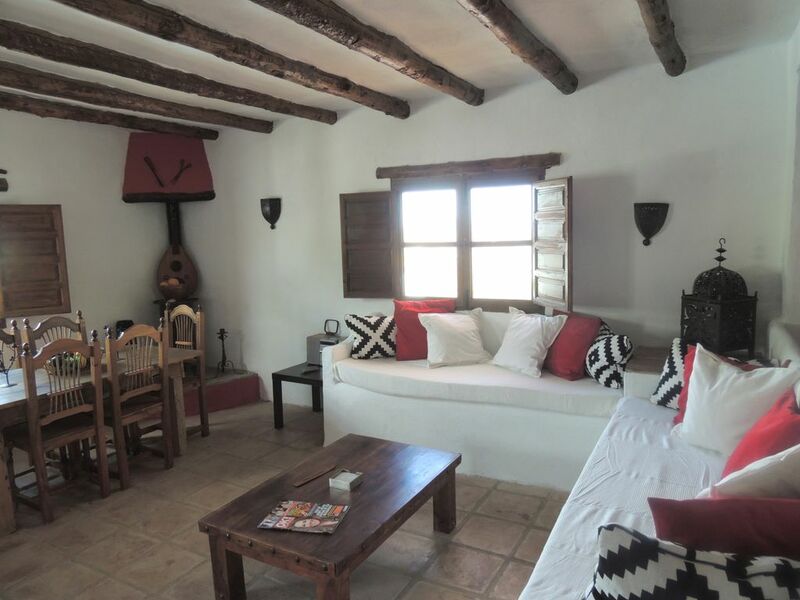 The house has been furnished in a very traditional style and enjoys breathtaking views of the national park and village. The property has a large entrance hall/lounge/diner and a fully equipped kitchen. Outside a shaded patio awaits, where you can dine and enjoy the pool, sun terraces and views. You are surrounded by olive groves and almond trees and the mossy amazing views you could ever find. The area is wonderful for simply relaxation, exploring Andalucia & walking. The beach of Torre del Mar is 20 min. Malaga 35min. and Granada within an hours drive. TV with android box for you Netflix amazon sticks. WIFI available . Included in rates in peak season JULY AUGUST. On request other months. There is a walk in shower of a good size. A traditional basin and toilet. Large mirror. All linen supplied and beds are made up for your arrival. Wifi internet available year round. June July and August it is included in the price, for other months, please ask. We provide all bathroom shower towels. We also supply pool beach towels for your use during your stay. We also provide use of pool towels for your use. We provide most items we think are needed for you during your stay. Plates, cups pans, utensils. However should there be anything you need , we can happily supply this . Full kitchen with all you need. There is a dining table inside for 6, but there is also a large table and chairs on the outside terrace. TV There is an android box. This enable you to receive some UK AND WORLDWIDE channels , but you can bring your own plug in device for netflix or amazon. The house is set in its own grounds of Olive groves. Several terraces, both shade and full sun. Private pool and very secluded. A lovely little villa in a nice location. We hardly went out the week we were there. The kitchen is small but has everything you need and the BBQ was an added bonus. Lisa was very hospitable, answering any questions I had and getting some basics in for us as we arrived on Sunday and all the shops were closed. Thank you for a relaxing week! Our family (wife, 3 daughters & myself) had a wonderful time in Monte Clara. It's a lovely little house in a peaceful & beautiful setting, & in a great location with beaches, Malaga, & various other interesting places all within a 35 minute drive through amazing scenery. Julian & Lisa were great. Julian came regularly to clean the pool & check everything was ok. A couple of lightbulbs went during our stay, & when we told him about it he went straight to the local shop & came back to change them. Both were very friendly & personable. They have great knowledge about the area & restaurants etc, & we always enjoyed our conversations with them. Riogordo can be seen from the terraces & is only a few minutes drive away & is a lovely little Andalusian town with friendly locals, a small supermarket, petrol station, & a few nice & very reasonable restaurants & bars. Perched on the hill behind Riogordo & a short & stunning drive further is Comares - one of the highest towns in Andalusia - a beautiful little very old Moorish town with cobbled pedestrianised streets full of character & with breathtaking views over the surrounding area. Monte Clara has plenty of Spanish character, & we enjoyed some lovely tranquil days there making the most of the pool, views, & barbecue. The pool is a decent size for a family, & we managed to teach our youngest daughters to swim in it, so for this reason & many others I'm sure Monte Clara is a place we'll always remember fondly. That you for a lovely review. means a lot to get such a heart felt review and from young children especially. well done girls. We booked the villa for a surprise birthday present after having problems travelling to the villa Lisa and Julian couldn't have been more helpful arranging their daughter to take us to malaga so we could continue our holiday. The villa is stunning, everything a family would need and had everything you need for a holiday the pool was beautiful with plenty of room for 5 with room for more and was kept really clean and maintained to a high standard by Julian who came to clean and was very friendly and helpful. The views from the villa were breathtaking situated in a perfect area for any type of holiday would definitely come back again. Couldn't meet a nicer couple and we will be highly recommending to our family and friends. Thank you so much Julian and Lisa for making our holiday so special. Riogordo is situated in the Axarquia region of Andalucia. The Lake of Viñuela is only a short drive,with the Larger Lakes of Andalucia being within 1 hour. Riogordo is ideal for those wanting to explore Andalucia and the real Spain with excellent motorway links to Granada, Sevilla, Malaga and Cordoba .The ski resort of the Sierra Nevada is also only 1hour 45 min away.